Quantity: #MRPG: Minimum 300 pieces. #MRGE Minimum 300 pieces. #MRGEP4: Minimum 100 pieces. For orders above catalog quantities, please contact your distributor for production time. #MRPG:Fine Point: Black, Blue, or Red Ink. #MRGE: Fine Point: Black, Blue, Red or Green Ink. Trim/Grip/Ink Color: Choose from selection shown. 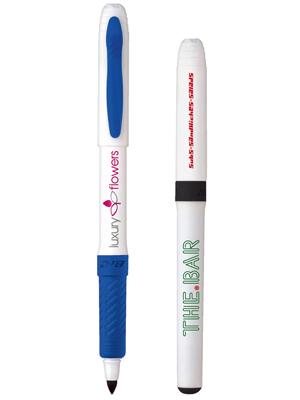 All markers include textured rubber grip and white barrel. Ink color matches trim color. Barrel Imprint Area: 1 1/2" x 5/8"
Cap Imprint Area: 1 1/2" x 5/8"
Color 2: Add $.12 per marker. Color 3: Add $.12 per marker. Color 4: Add $.12 per marker. Up to 4 colors available on any cap/barrel combination. Add $.12 per marker for each color in second location. Imprint put on cap unless otherwise specified. #MRPG: Standard - 9 lbs. (approx.) @ 300 per carton. #MRGE: Standard 10 lbs (approx.) @ 300 per carton. #MRGEP4: 14 lbs. @ 100 pouches per carton. Special packaging (click here).